Have you heard about the The Teal Pumpkin Project™? Children with food allergies often have trouble participating in celebrations that center around food, and the The Teal Pumpkin Project™ helps raise awareness of food allergies plus promotes inclusiveness for all types of trick-or-treaters on Halloween. So what do teal pumpkins have to do with Halloween? 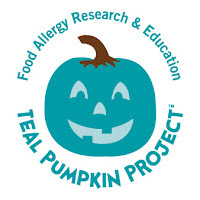 By displaying a teal pumpkin on Halloween you are telling families with food allergies that you have non-food treats which will allow their children to enjoy some treats they can collect trick-or-treating. This initiative doesn't just benefit children with nut, dairy or other allergies, but children who cannot eat candy for other health reason, too. Today I am going to paint a craft pumpkin teal that I can use year after year to indicate that we will have some non-edible treats available so every kid can Trick-or-Treat at our house safely. We purchased some mini bubbles to hand out alongside candy. I know that Lucky would be just as excited to get some bubbles as he would a piece of chocolate! Unlike the candy we purchased, any leftover bubbles can still be used next year. To participate, you don't have to have a physical teal pumpkin that you put on your walkway. You can draw a pumpkin to display in your window or print out a flyer from the website. Will you take the pledge with me to provide some non-food treats on Halloween?